In 1847, 47 Tasmanian Aboriginal people incarcerated for fifteen years at Wybalenna on Flinders Island arrived to take up forced residency at Oyster Cove station, an ex-convict government settlement 35 miles south of Hobart. The arrivals consisted of 5 boys, 5 girls, 23 women and 14 men, all who remained of some 200 Tasmanian Aboriginal people who had been compulsorily and officially removed from across Tasmania. Their return was officially recorded as a budgetary measure, but could also be viewed as a means to allay guilt for what non-Aboriginal people viewed as the 'last' of a distinct race dying outside their home territory to which they had continually asked to return. There was outrage at the return to mainland Tasmania of its original inhabitants. Tasmanian pastoralists recalled bloody skirmishes, and held a special meeting to protest the advent of 'these savages to their primitive home'. In part responding to these fears, the government described the non-threatening state of the thirteen Aboriginal men, saying they had either been reared by Europeans or worked for them, had lived for fifteen years 'in civilised habits' and 'are almost all addicted to gardening'. On arrival, eight children were removed to the Queen's Orphan Asylum in Hobart, and it is not known what eventually became of four of them. In bringing this group of mostly aged or incapacitated Aboriginal people back to mainland Tasmania, the government disregarded the growing population of Aboriginal people living across the Furneaux Islands but outside the official Wybalenna settlement. These outcasts were considered separate by dint of their so-called hybridity of parentage, language and customs. These differences provided the means of exclusion from any recompense due for their own, their parents' and their grandparents' losses, including country, resulting from European invasion. Upon arrival at Oyster Cove, the newcomers performed ceremonies. This may have boded well except that the site was damp and unhealthy, proper maintenance was never undertaken, provisions were poor and non-Aboriginal administration was inadequate. Local game was eliminated rapidly. 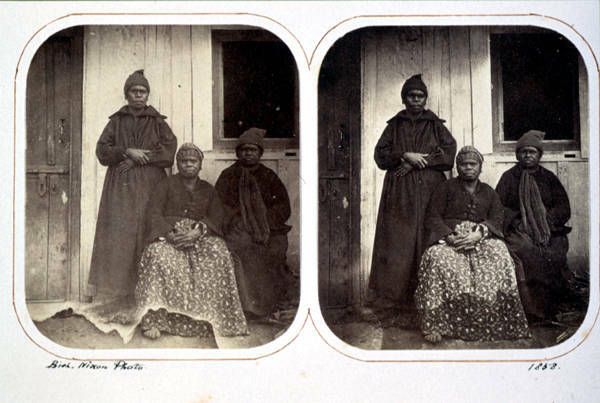 Over the next few years the Aboriginal population declined in health, spirit and number, though some undertook extended hunting trips, in one instance to South Cape in 1848 and another walking to Port Davey during a six-week absence in 1860. Other activities included general hunting and food gathering, traditional medicinal practices, diving on wrecks to procure lost goods for payment, fishing, shell necklace making and fibre practices, gardening, collecting firewood, frequenting local taverns, tending their thirty dogs, being constantly visited by outsiders and occasionally attending events in Hobart town. Five men went on whaling voyages. By 1851, 13 of the 46 had passed away. In 1855 John Dandridge took charge and improved care, despite the government halving its expenditure. This kindness was too little, too late and the population continued to decline. By 1859 only twelve people remained. Oyster Cove was occupied by Aboriginal people until it succumbed to heavy flooding in the winter of 1874. The site was then abandoned. The last remaining Aboriginal inhabitant, Truganini, a Nuenone woman whose country was Bruny Island opposite Oyster Cove, was moved to Hobart and lived for the remaining two years of her life with Mrs Dandridge, wife of the former superintendent. Oyster Cove today symbolises the unity and resolve of Tasmanian Aboriginal people to redress wrongs of the past by political means. In 1981, the state government proclaimed 30.3 hectares of the Oyster Cove Station an historic site. In 1984 the Tasmanian Aboriginal Centre occupied Oyster Cove and claimed land rights for the site. After several attempts, in 1995, 10 hectares at Oyster Cove were among the 3800 hectares transferred to the Tasmanian Aboriginal people. Today, Oyster Cove is a peaceful place, surprising considering its fraught history. Each year the Tasmanian Aboriginal Centre hosts the Oyster Cove Festival – a day of community, music, food and remembrance. Having this place, where many of the Old People spent their last days, under Aboriginal care is an affirmation of the cultural and spiritual responsibility of Aboriginal people to maintain and build relationships with their people and country. Further reading: AOT, CO 280/133 pp 146–86, roll 502; Examiner, 2 October 1847; N Plomley (ed), Weep in silence, Sandy Bay, 1987; L Ryan, The Aboriginal Tasmanians, Brisbane, 1996; C Fulton, 'Oyster Cove', Puggana News 26, 1987; G Lennox, Oyster Cove Historic Site, Hobart, 1984; W Denison, Varieties of vice-regal life, London, 1870, and Hobart, 2004.